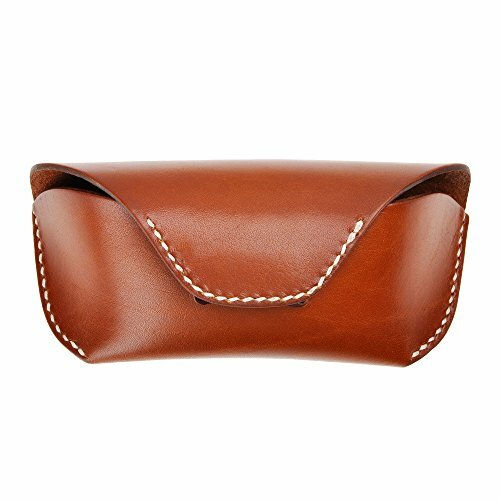 This genuine leather glass case offers an stylish way to carry your favorite eyeglasses or sunglasses. Made from 100% geniune full-grain thick cow leather with contrasting hand-stiched details. It has a large compartment that can fit most standard sized eyeglasses or sunglasses. This magnetic snap closure eyeglass case will keep your glasses secure in the case at all times! And it can be attached to a belt, great for outdoors or your adventures. -Keep in the area with good airflow and low humidity. -Besides, please allow 1-2cm measurement differ due to manual making. -Your understanding and support are highly appreciated! -If any problem, please feel free to contact us and we will be glad to assist you! Magnetic snap closure, easy to open and close, and keeps your glasses securely in the case at all times.